Galeria’s building at the corner of 24th and Bryant. 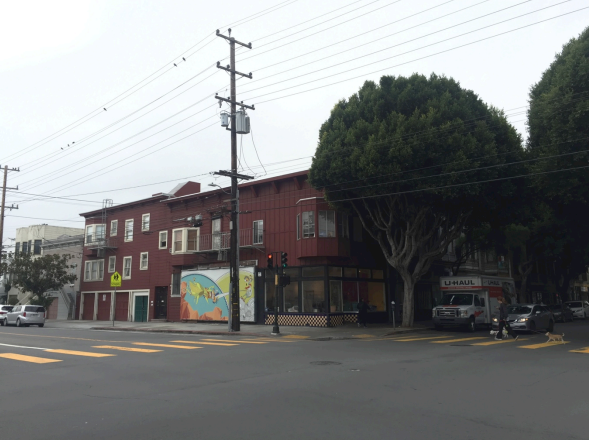 The process has been initiated to designate Galería de la Raza’s former building at 24th and Bryant as a city landmark, despite objections from the building’s owner. The Historic Preservation Commission on Wednesday voted unanimously to set this process in motion following testimony from a long procession of speakers in support of making the building a landmark and honoring the gallery’s nearly five-decade history there. It would be the first building in the Mission to be landmarked in association with 20th Century Latino history. In October, the gallery was forced out of its longtime space after negotiations crumbled between the gallery’s leaders and representatives of 93-year-old property owner Lily Ng. The gallery last month moved into a temporary space on Valencia Street while its leadership waits for two potential spaces to be built in the next two years — one at 16th and Folsom streets and another at 24th and Folsom streets. Both are earmarked as a potential home for the gallery. Although the Galería has vacated its longtime 24th Street home, it applied for the landmark designation two years before the drama began. The hope, many argued, is to preserve the gallery’s long history at the space in the public consciousness. Family members claimed that the designation would decrease the building’s value. “She doesn’t want any restrictions on her private property,” said Rose Chen, one of Ng’s relatives. McDonald and several of Ng’s relatives argued the commission should push its vote back to a later meeting. Yet, as several commissioners pointed out, the vote only kicked off a multistep process that puts the matter in front of the commission again and, later, requires final approval by the Board of Supervisors. If designated, the property owners would technically be constrained by the designation, but those restrictions are not necessarily major and may not lower the value of the building. Williams said if the building owner wanted to make changes to the building’s exterior — or if the designation includes the interior — the owner would have to go before the preservation commission for approval. That includes characteristics of the building’s facade — of which there are many — like “horizontal wood channel siding,” as well as the interior, like “raised window display areas.” Not many interior character-defining characteristics are listed. The terms of the designation are to be negotiated over the next few months. Supporters of the preservation are likely to push for the inclusion of a mural billboard on the side of the building, as well as the preservation of interior features of the gallery. And the historic designation would not be solely based on the gallery’s history in the building. The structure, erected in 1895, “appears significant for its association with suburban expansion and commercial development in San Francisco’s Mission District during the second half of the nineteenth century, and as a rare example of a neighborhood mixed-use storefront building of the period, featuring Italianate, Stick/Eastlake, and Edwardian design elements,” notes a Planning Department analysis. The Galería’s current bid for landmark status reminded many of the historic preservation commissioners of Marcus Books on Fillmore, which was designated a landmark in 2013 shortly before it was evicted from the space. Although the book store doesn’t currently occupy the space, it remains a landmark. A totally egregious, politically-motivated taking under the guise of “preservation”. Unfortunately, the net result of this stunt will be to make it so landlords won’t even consider renting to such non-profits in the future for fear of being vilified once the lease is up.